Tyler Anbinder, a professor of history, spent 15 years researching immigrants' stories for his new book on the immigrant experience. A history professor has spent the past 15 years working on book to show the similarities in the stories of American immigrants throughout the last four centuries. 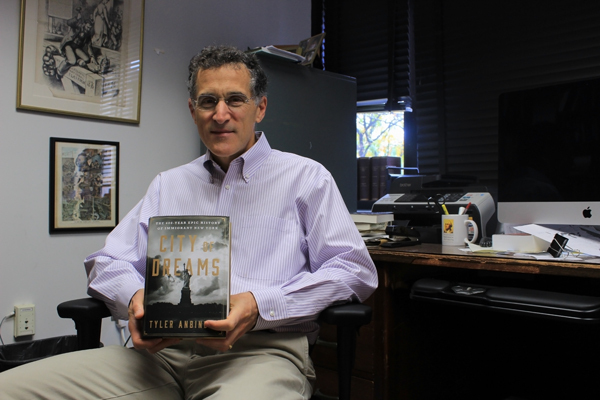 Tyler Anbinder, a professor of history, published a book last month titled “City of Dreams: The 400-Year Epic History of Immigrant New York,” which examines well-known characters like Dominican-American fashion designer Oscar de la Renta and Italian bodybuilder Charles Atlas who immigrated to the U.S. through New York. By comparing the prominent figures’ stories with those of unknown immigrants, Anbinder said he hopes to show that immigrants across generations have similar experiences. Anbinder said in his research, he noticed that Americans are always “weary” of immigrants and tend to blame them for their problems, even when immigrants are rarely the cause. Anbinder hopes to show readers America has had a complex history with immigrants, he said. But he said he thinks the book can speak to everyone in U.S. in some way through the stories it shares. Anbinder’s book has been praised by both The New York Times and The Boston Globe for telling a rich story of American immigration at a timely moment in history. Anbinder said he has always been interested in researching his own family tree and incorporated his ancestry in the book. In the chapter about German immigrants, Anbinder references immigrants from Germany on his mother’s side and features the family on his father’s side in a chapter about Eastern European Jewish immigrants. “My hope is that this book will inspire people to do that on their own, to look for their own immigrant ancestors,” Anbinder said. For his research, Anbinder read old newspapers, immigrant memoirs and ancestry.com. He also hired 10 undergraduate research assistants at GW to contribute to the research over 15 years. Anbinder said the book was an ongoing project with no fixed deadline, and he used the 15 years to compile the large amount of research needed for the book. He added that he chose research assistants from students who were doing well in his classes, and he preferred to hire freshman because then they could work with him throughout their time at GW. Zach Sanders, a junior who was one of Anbinder’s research assistants, said he formed a relationship with Anbinder after taking his class, “The Civil War and Reconstruction,” freshman year. During his time as research assistant, Sanders helped assemble a population data table of people living in New York City from 1850 to now, organized by nationality. The table is meant for people to use as a reference and appears in the front appendix of the book, Sanders said. Sanders said his grandparents immigrated to America right before the start of World War II, but he had not learned much about that part of American history.